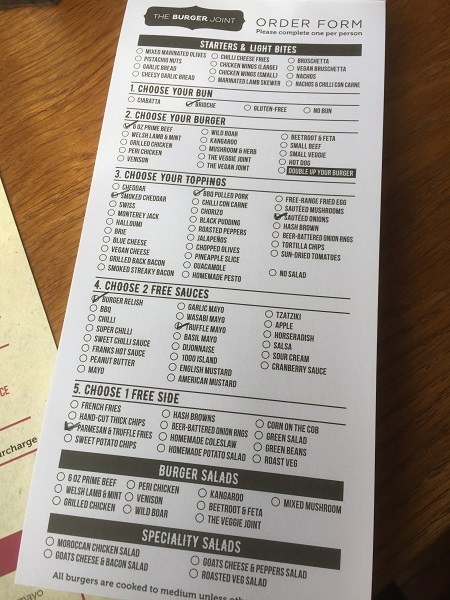 If you’ve not been to The Burger Joint before, you’re missing out: they now have restaurants in Clifton, Southville and Fishponds, serving up a DIY burger menu where you choose your bread, your patty, your toppings, your sauces and your sides from a book of tear-off menus that allow you to simply tick the options you want and hand your order to the waiting staff. All the old favourites are still on the menu, but there’s plenty of new stuff to try: a vegan burger as well as a beetroot and feta patty; additional toppings in the form of smoked Applewood, chopped olives and vegan cheese; two new sauces (truffle mayo and basil mayo); and the addition of Parmesan and truffle fries as a premium side. After taking a seat at a table by the window, it was time to make those tricky choices, accompanied by some amazing music from the Beach Boys to more rocky stuff. The burger itself was fantastic: tender and juicy, and lovely and peppery, in a brioche bun that held together nicely and had plenty of flavour. Along with the lettuce, tomato and onion that comes as standard, I was impressed with my finely chopped onions which were super soft and nice and sweet, and the pulled pork that was beautifully rich, although maybe a little too sweet for my taste. 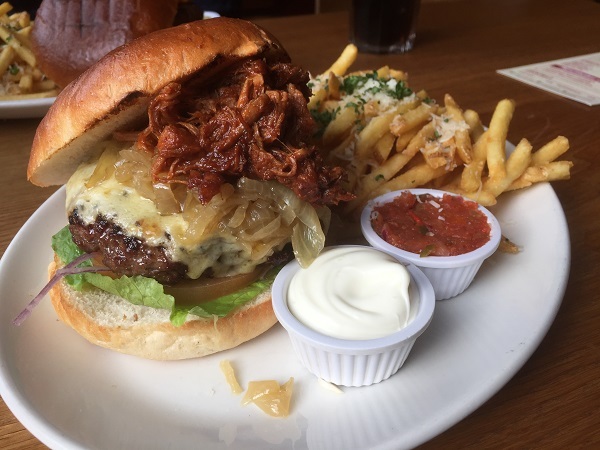 The smoked Cheddar was beautiful, but the burger could have done with a little more – it was a very thin slice, and the flavour was somewhat lost amongst all the other toppings. The finely chopped burger relish was packed full of super fresh flavours, while the truffle mayo was tasty, but a little light on the truffle flavour. Chris chose the same brioche bun, but with completely different fillings. 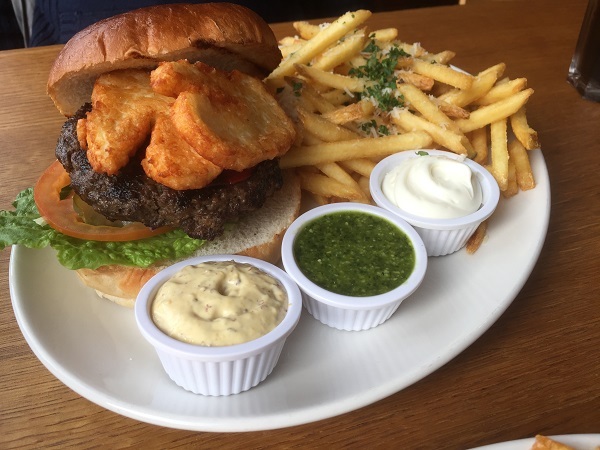 The Welsh lamb and mint patty (one of my favourites at TBJ…) was succulent and beautifully flavoured, while the generous, thick slices of halloumi were perfectly cooked, its saltiness stunning with the sweetness of the lamb. A few thin slices of chorizo completed the burger, with his truffle mayo, piquant Dijonnaise and a truly amazing homemade pesto (loads of cheese and with a real punch) served on the side. It’s hard to fault The Burger Joint: the beautiful restaurant, great service and vast amount of choice on the menu generally always make for a great meal – and with that number of breads, patties, toppings, sauces and sides to choose from, you could probably eat there every week of your life and never have exactly the same order. Pretty impressive.